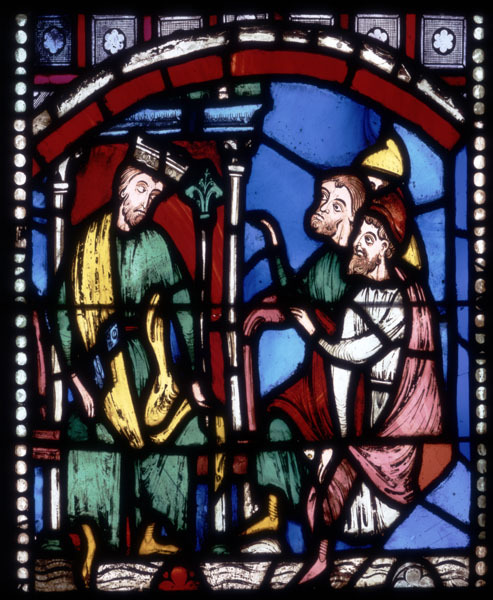 This panel of stained glass, dating from the age of the great French cathedrals, was originally one of thirty-six scenes in a tall Gothic window from Rouen Cathedral. The entire window was dedicated to an account of the miraculous resurrection of seven Christian martyrs after centuries of sleep- a tale that confounded those who doubted the belief in the resurrection of the body. This episode shows two messengers coming to announce the news of the miracle to the Byzantine emperor Theodosius II. The narrative is relayed by conventions common to medieval storytelling: the building represented by a single arch, exterior and interior spaces differentiated by red and blue backgrounds, and the drama of the meeting suggested primarily through gesture. Highly colored sections of glass in blue, red, yellow, violet, and green were cut to fit the figural design; and details of faces, garments, and architecture were drawn on the glass with dark brown vitreous washes. After the drawn details were fired onto the surface, the segments of glass were joined together with lead cames (grooved bars) and set within a complex iron framework. The entire structure was enclosed in one of the great stone window openings of the cathedral's nave.